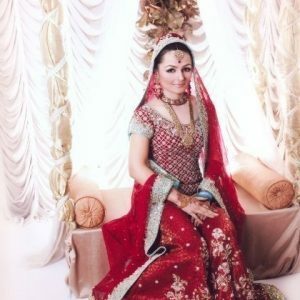 Tags: Bright Red, Front Open, Nikah & Engagement, Sharara, Wedding Outfit. Top: Bright red pure chiffon front open gown having embroidered bodice. Center slits have embellished borders. Large embroidered border has been implemented on hemline. Small motif spray scattered all over the gown. Finished with satin piping. Fully lined dress. 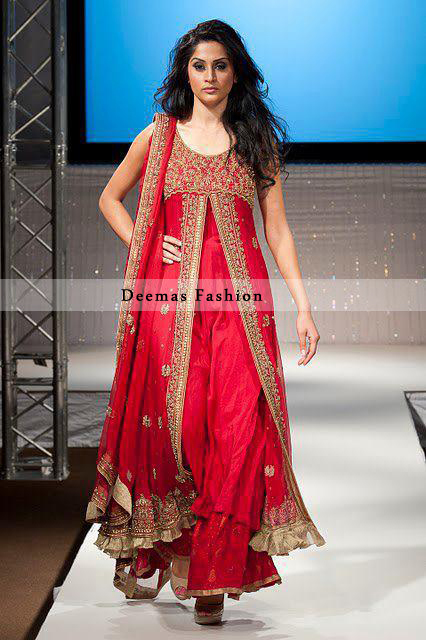 Bottom: Fully lined pure chiffon sharara has been finished with golden border. Dupatta: Bright red pure chiffon dupatta having four side embroidered border. Ornamental motifs spray scattered all over the dupatta. 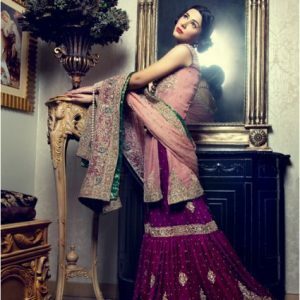 Embellishment work includes Kora, dabka, stones, beads, sequins and tilla work.